The refugees' great march to Europe highlights global fractures that can no longer be avoided. 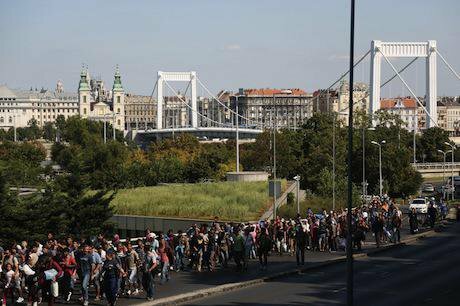 Migrants bound for Germany walk through the streets of Budapest. Demotix/Beata Zawrzel. All rights reserved.The March is a remarkable film shown on TV channels across Europe all of 25 years ago, but set a decade or two hence in the early twenty-first century. In a world sharply divided by poverty and affected by climate change, it portrays a charismatic young teacher in a Sudanese refugee camp who galvanises his fellow inmates to walk to Europe. Much of the film tracks the 'march' itself, by turns attacked, threatened and aided, but attracting the growing attention of the world’s media as the refugees make the dangerous trek across the desert to Morocco. Once there, they persuade dozens of boat-owners to ferry them in a veritable flock of small boats across to Spain, where they land en masse in a hastily evacuated resort surrounded by the newly created European Border Force. The March – written by William Nicholson, directed by David Wheatley, with Juliet Stephenson in one of her early leading roles as the EU commissioner – was well received, and has occasionally been shown on cable TV. But it had little political impact. This is partly owed to timing; it was screened just as the Soviet Union was disintegrating and the cold war ending. Ironically, the great boost that the collapse of the Soviet bloc gave to 'turbo-capitalism' then did much to exacerbate the wealth-poverty divide and curtail the needed response to climate change. What is really astonishing about The March is its prescience. Its then near future has now arrived. 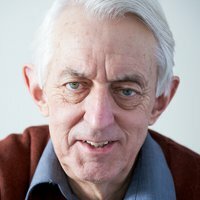 Hungary is authorising its army to protect the state against hordes of threatening migrants; Donald Trump calls for “a great and beautiful wall” on the Mexican border; the Sun newspaper warns of a million migrants coming our way; all-night sessions in Brussels talk of establishing a European coastguard. The very scenes portrayed in Wheatley’s film are now happening in real time. But that prescience was already clear barely a year after it was shown, when the collapse of Albania's economy led thousands of young people to seek to cross the Adriatic to southern Italy on cargo ships (see "Migration, climate and security: the choice", 3 September 2015). The event culminated in the arrival of the Vlora in Bari harbour, with many Albanians streaming ashore. It made the headlines in Europe for a day or two but, like the recent screening of The March, was quickly forgotten. Today, the expanding refugee crisis across Europe makes it clear that the European Union is no more ready than when Juliet Stevenson uttered those words. In many ways the resistance to action has become more subtle. A kind of distinction is now being made between people fleeing war at risk of their lives, and those 'merely' seeking a better life from poverty and marginalisation. The former might be grudgingly admitted, albeit often in small numbers, but the latter are a threat, with “swarms” of them ready to overwhelm us. What is almost never recognised is that there are two elements to what is now happening. The first is specific to the wars and conflicts, primarily in Syria but also in Iraq, Afghanistan, Eritrea, southern Sudan and parts of the Sahel, some of these having been made far worse by western interventions. The second is much more generic, but it overlaps with and reinforces these particular tragedies. The reality here, as often argued in these columns, is of a deeply divided world where wealth is more and more concentrated in the hands of perhaps a fifth of the world’s population. Yet a marginalised majority of growing numbers also has much improved access to education, communications and knowledge of world circumstances than 40 years ago. The combination means that the potential for frustration and the urge for a better life are steadily intensified. Add to this the factor of climate change, with all its disruption and socio-economic impact, and the situation becomes even more febrile. Its fuller effects could yet be a decade or more in the future, but these are inevitable without redress of the deep failings of a neoliberal economic model that is simply not fit for purpose, and made much worse by its reluctance to acknowledge the impact of climate disruption. Europe is patently not ready even for the current problems, let alone future ones. Nor is the United States, Australia or many other countries. The strong current tendency is to close the castle gates, to see population movements merely as threats, and to use whatever means are needed to maintain elite security. That approach, though, has an insurmountable flaw: it's impossible to shut the castle gates in a globalised and thoroughly interconnected world. It hardly needs to be recalled what a few determined young men did in the 9/11 attacks to realise that, yet there is consistent failure to do so. Somewhere, somehow, at some turning-point, there has to be a transformation of attitudes. And Europe – precisely because of its proximity to so many examples of marginalisation and climate disruption – may prove to be its necessary centre. Perhaps the most important thing to recognise is that this is in no way idealistic but, on the contrary, an example of hard realism. The misplaced idealism lies in the idea that change can be avoided, that the more wealthy can always be secure. But change is essential. There really is no alternative.